I got this darling silver fortune cookie on a trip to San Francisco at Gumps. My dear friend got one too. We made a pact to fill them with wishes and goals for ourselves. There's something awesome and empowering about writing your own fortune. Resting on my side table, it catches my eye every morning and reminds me of all that I have to be grateful for. How cute is that. I want one! I have a lucky horse shoe given to my husband by my Father on our wedding day. I love lucky symbols! My husband got me the silver fortune cookie for our anniversary a couple years ago. I adore it! He had written a very special message inside. I may need a gold one, too! Isn't it wonderful to look at daily and remind ourselves of everything we have to be grateful for! So very true! How did you like Gumps? What a fun and inspirational concept, also very beautiful. Thanks for sharing! I love that little cookie. I've seen them before and they make me smile every time. I love to bake up a few and put my little messages in. BTW I've included you in that tag game that I got tagged in so head on over to my blog and play the game K? If you don't have time, no worries, I was barely able to even do it. Hope you are doing well. Love this... so cute!! What a great idea to remind ourselves of our gifts and goals. What a great idea to remind ourselves of our gifts and goals. Love this... so cute too! Gorgeous! Tried to buy one, thanks for your reference but all sold out in silver! On my wish-list now! I Love this idea… I want one in silver! totally want this! Thanks for sharing! Absolutely charming!! 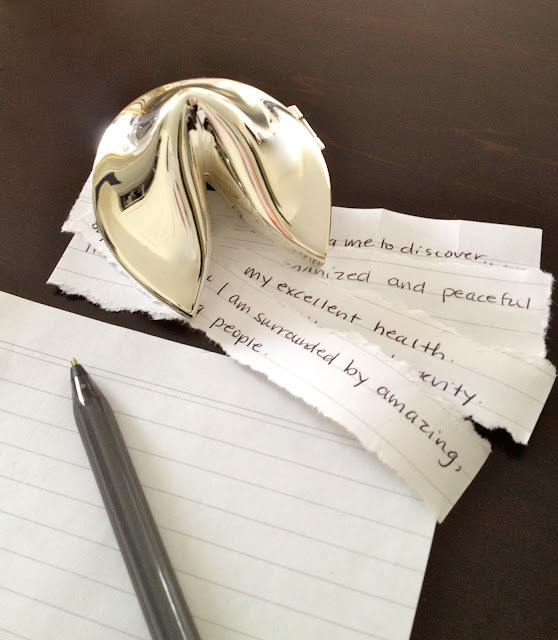 I love that you are writing your own fortunes, super creative and inspiring!